Dwayne “The Rock” Johnson, known for his glorious past in wrestling and portrayal of the Tooth Fairy in a movie sharing the same name, now has an alarm clock app on Google Play. 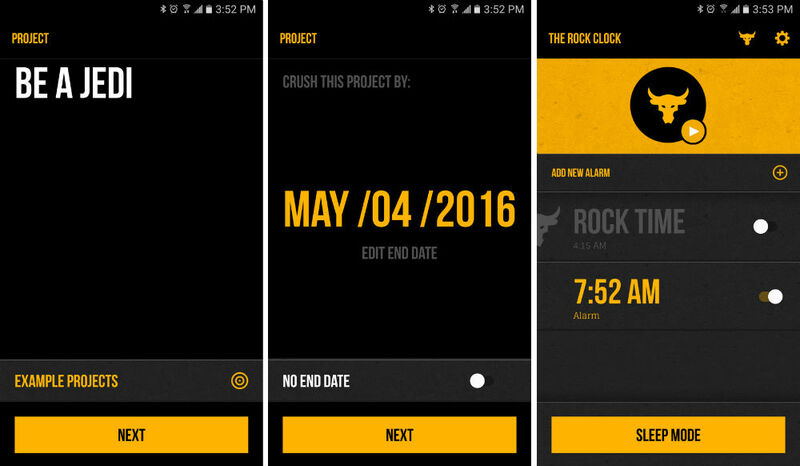 Called The Rock Clock, this basic alarm app asks you to provide a project — or goal of some kind — followed by a date at which you want to complete it. For example, I could set a goal to finish this post by next week, then set a time of 7am for the app to wake me up each morning. And that’s it. Besides just waking you up in the morning, The Rock Clock offers new alarm tones for you to wake up to, including a few even sung by The Rock himself. Additionally, if you want wake up at the same time as The Rock, you can set the Rock Time. Rock Time means your alarm will go off at the exact time The Rock has his alarm go off. And let me tell you, it’s early. According to the app, he has his alarm currently set for 4:15am. Thanks, but no thanks. Not only can you wake up with Dwayne, but The Rock also sends out video messages to users of the app. These messages will likely be motivational in nature, maybe even featuring a few curse words here and there. That’d be badass. The app is completely free to download and there are zero in-app purchases. Give it a go if you can’t get enough Rock in your life.